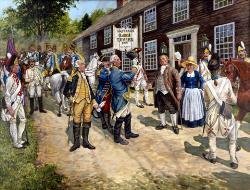 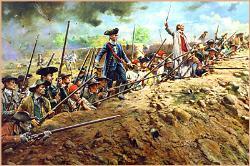 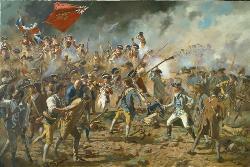 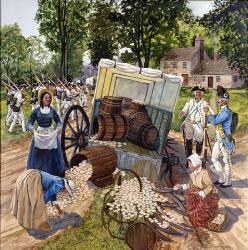 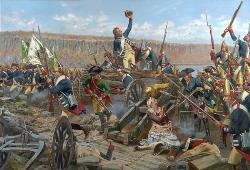 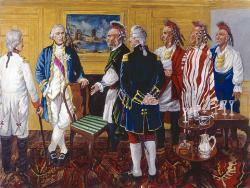 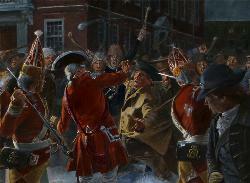 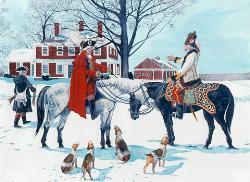 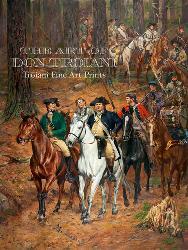 In 1777 the British government approved two plans to quell rebellion in America. 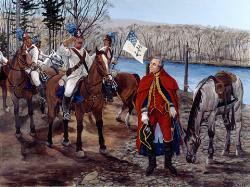 One army, commanded by General Sir William Howe, intended to capture Philadelphia while the other, commanded by Lieutenant-General John Burgoyne, was charged with advancing from the Province of Quebec to Albany, New York. 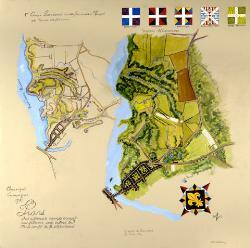 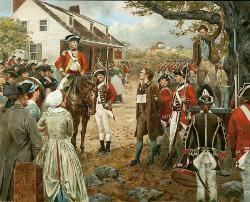 After capturing Albany, Burgoyne would take further operational instructions from Howe. 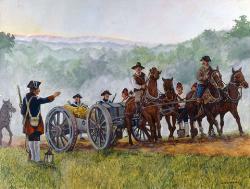 With British forces on the offensive, Army of the United States commanders had to develop defensive strategies. 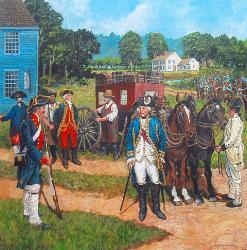 General George Washington made plans to face Howe directly while Major General Philip Schuyler, commander of the Northern Department, had the inevitable role of defending against the invasion from Canada. 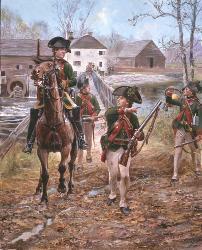 Burgoyne’’s offensive began in earnest in June 1777 and proved more than a match for Schuyler’’s smaller, ill prepared army. 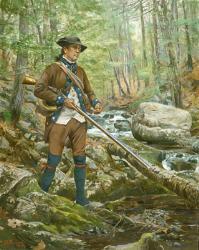 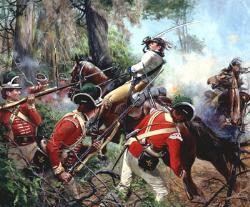 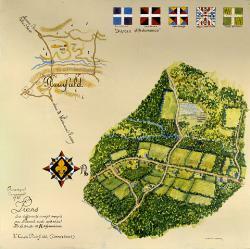 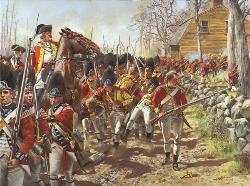 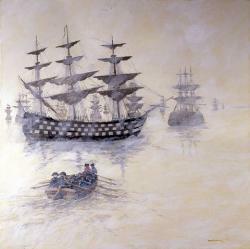 Multiple British military successes in July placed doubt amongst many that Schuyler was capable of stopping Burgoyne. 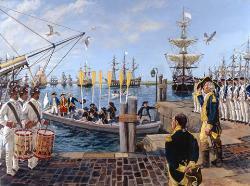 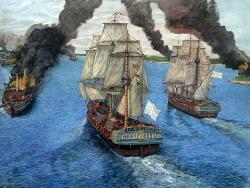 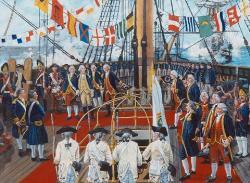 The beleaguered commander was relieved by Major General Horatio Gates on August 19th. 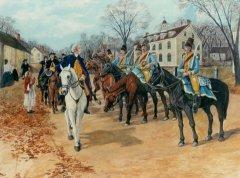 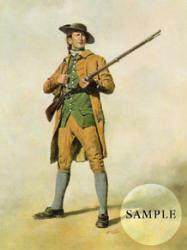 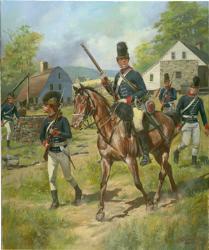 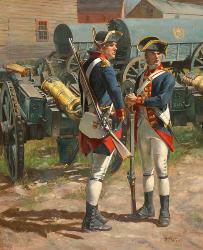 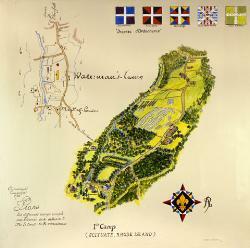 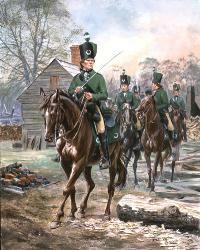 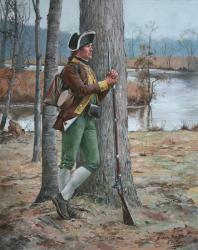 Due to the need of an elite force of “Rangers” to fight Howe, Washington formed the Detached Rifle Battalion in June. 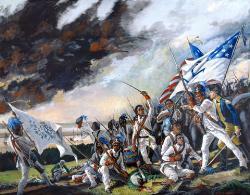 Commanded by Colonel Daniel Morgan (11th Virginia Regiment), Lieutenant Colonel Richard Butler (1st Pennsylvania Regiment), and Major Joseph Morris (1st New Jersey Regiment), the corps’’s 500 officers and men were drafted from Virginia and Pennsylvania Continental regiments. 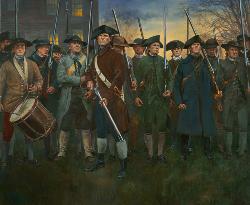 The men selected were “perfectly skilled in the use” of rifles, as well as “active and orderly in their behaviour.” Because most were initially armed with muskets, Washington ordered that “such rifles as belong to the States, in the different brigades, to be immediately exchanged with Col. Morgan for musquets.” If “a sufficient number of rifles (public property) can not be procured,” brigade commanders were asked to assist Morgan “either by exchanging, or purchasing those that are private property.” Because the Northern Department had no riflemen, and its troops were “so intimidated by the Indians” fighting with Burgoyne, Washington sent Morgan’’s Detached Rifle Battalion to assist. 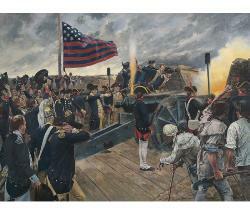 The corps, then 400 strong, arrived at the end of August. 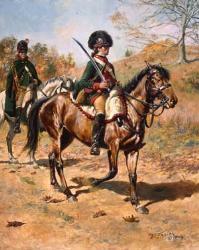 Upon his arrival, Morgan was also assigned command of Major Henry Dearborn’’s provisional light infantry; combined, the two battalions were known as Morgan’’s Corps. 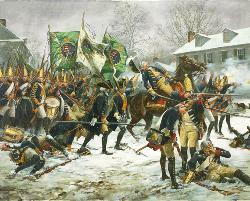 Reinforced and reorganized, Gates moved the army to Bemus Heights, about 25 miles north of Albany, and awaited Burgoyne’’s next move. 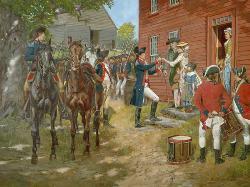 On the morning of September 19th, reports that Burgoyne’’s troops were marching to attack the camp prompted Major General Benedict Arnold to advise Gates to “March out and attack them” instead; Gates agreed, and Morgan’’s Corps was sent to make initial contact. 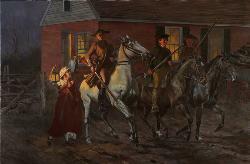 This scene depicts Morgan’’s Detached Rifle Battalion moving to Freeman’’s Farm at about 12:30pm. 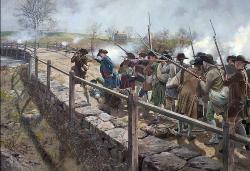 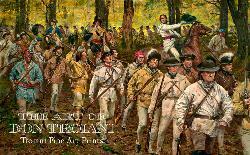 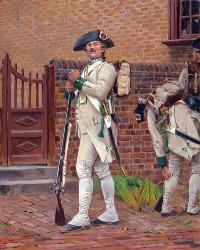 The Corps, with Captain Van Swearingen’’s Pennsylvanians in the van, marches in a column of files as Morgan, wearing his white linen “rifle” or “hunting” shirt, urges them on. 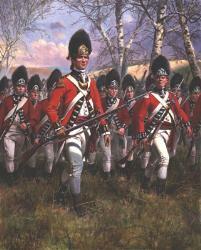 Behind Morgan is Butler, wearing the red cockade which marks him as a field officer. 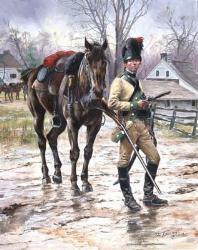 Morgan’’s blue-coated aid-major, Captain the Chevalier du Bouchet (a former French infantry officer who volunteered his services to the United States), watches with anticipation. 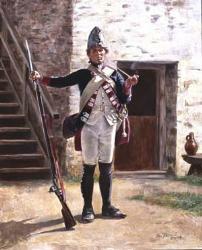 Flanking the column are Stockbridge Indian volunteers under Captain Abraham Nimham, serving as scouts for the corps. 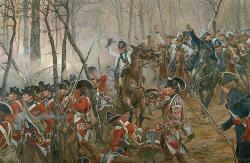 The long, drawn out column arrived at Freeman’’s Farm by 12:45pm, where its front successfully engaged a British picket but was subsequently outflanked by British light infantry. 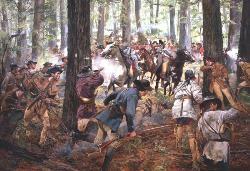 The riflemen were “broken and scattered in all directions,” and Morgan set about to reorganize their ranks. 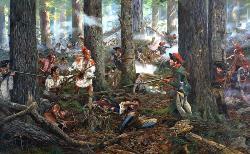 Following this initial blunder, the reformed riflemen were judiciously posted in the ravine-cut woods which anchored the army’’s right flank. 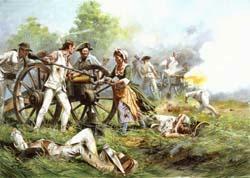 From the safety of this position, the riflemen mauled the ranks of the British 20th and 62nd Regiments of Foot and Royal Regiment of Artillery, inflicting hundreds of casualties. 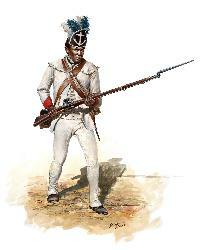 Darkness, a want of ammunition, and enemy reinforcements forced the riflemen to retire with the rest of the army. 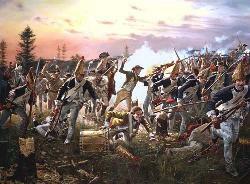 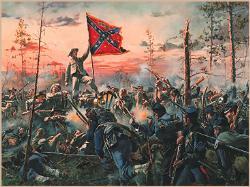 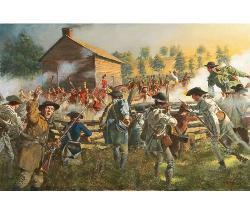 The Battle of Freeman’’s Farm was a tactical loss but a strategic success for American arms. 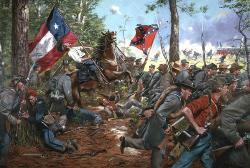 The rifleman suffered six men killed, nine severely wounded, and one officer—Swearingen—captured. 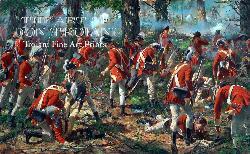 Burgoyne’’s advance upon Albany was permanently halted because of the hard fought battle of Freeman’’s Farm, for which Gates claimed that the “Glory of the action…was entirely owing to the Valor of the Rifle Regiment & Corps of Light Infantry” under Morgan’’s command. ONLY Format : Canvas Giclee (printed as ordered) 50 Signed/Numbered Overall: 22" x 35"
These canvas prints are varnished and on wooden stretchers. 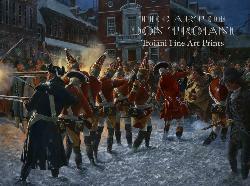 There is no white margin or titles, so that when framed they look a lot like the original artwork. 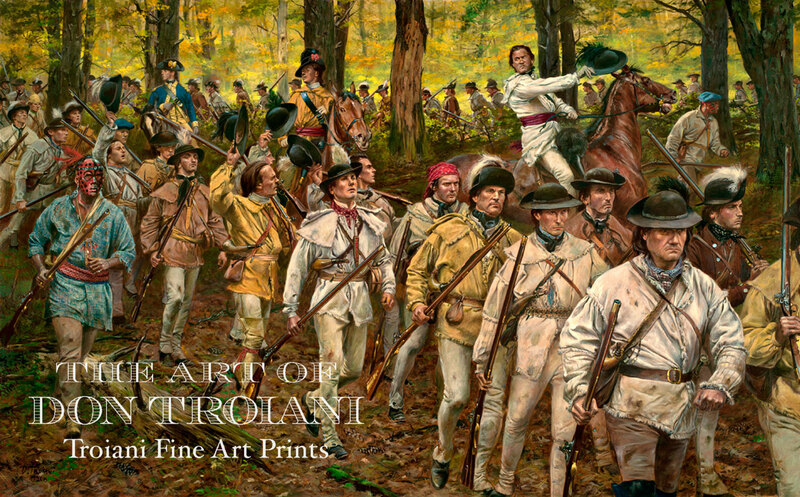 The image sizes we do for these are quite a bit larger than the regular S/N edition so the total effect is quite impressive. 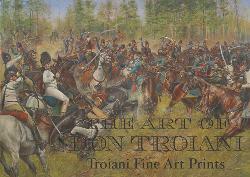 Edition sizes are kept low as to ensure the rarity and collectability and value. 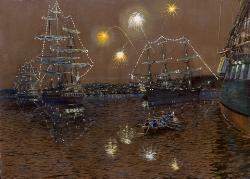 Each canvas giclee is signed and numbered and includes a certificate of authenticity and brass plaque with title engraved.